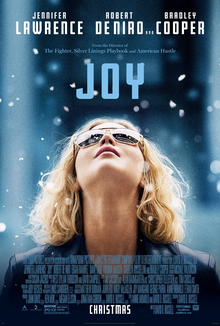 My first film of 2016 is the latest from David O. Russell, ‘Joy’, a loose biopic about Joy Mangano, a woman who invented the ‘Miracle Mop’ and went on to create her own business empire. The film focuses primarily on the origins of this story, beginning with Joy’s childhood before branching out to look at her efforts to get her mop on sale, with little time paid to Joy’s career after she became successful. This is a good choice and the film is at its strongest when Joy is backed into a corner and forced to overcome adversity. The film does take its time to get into the story, but once the film moves past Joy’s upbringing and family drama to focus on her movements into the business world it becomes a really enjoyable movie. Russell’s early direction is too showy and flashy, almost trying too hard to be different and it ends up being distracting more than anything else. The asides into the soap opera on Joy’s mother’s TV are distracting and not particularly relevant to the plot and the voiceover narrative isn’t really necessary (although Diane Ladd is always welcome). Once it settles down into a more conventional narrative format the film is much the better for it and the remainder of the film largely avoids the techniques used in the opening half hour. For the third film running, Russell returns to Jennifer Lawrence for one of the primary roles, with Bradley Cooper and Robert De Niro again providing support. Jennifer Lawrence is strong in the central role and Russell has filled out his cast with an established compliment of supporting performers alongside his regular players. It’s hard to believe that Lawrence has only been ‘known’ for around 5 years after ‘Winter’s Bone’ and her performance in the central role here is typically accomplished and shows her ability to expertly cover a range of emotions. I’m not sure some of the support is as strong here, although whether that is down to Russell’s stagey approach to some of the sequences or the performances themselves I can’t be sure. Isabella Rossellini is one of the bigger disappointments with an over the top portrayal that doesn’t feel quite in sync with what other cast members are going for. Edgar Ramirez and Dascha Polanco are both great though. ‘Joy’ is a good film about a fascinating true life story, but it struggles with Russell’s direction at times and with the approach to take to the subject matter. An enjoyable start to the year nonetheless.